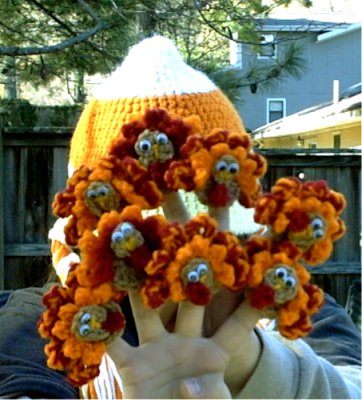 crafty lil' thing: Attack of the Crochet Turkey Fridgies! 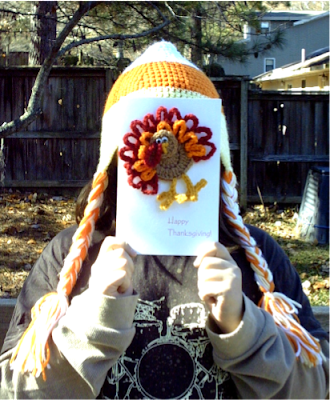 A few weeks ago, Jennifer, paper pieced quilt square goddess, and sender of random acts of kindness that make little girls squeee and bounce, posted a pattern for a very cute crochet turkey on her blog on sewhooked. You can find Jennifer's pattern here. They are so cute and fast, your should really make a half dozen or so. Some are fringies, some are finger puppets, they make great lapel pins too. We made them into Thanksgiving cards and sent them to all our friends. 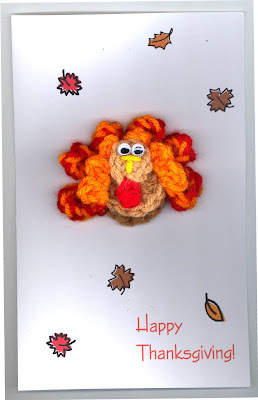 And, because we just couldn't help ourselves, we've designed our own Turkey Fridgie. 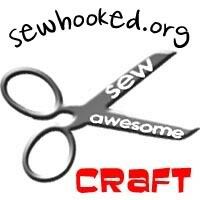 Thanks for the fun pattern Jennifer! wow! ou guys went bonkers! i love it gobble gobble! plus love ks hat! did you make that? would you consider posting a pattern? Bonkers! Oh yes! That's us! K's hat has been such a big hit, I really need to figure out how I made it. I'll try to write it down and post it before Christmas, but I am so not good at writing patterns. And you have inspired K to try archery! She's been interested for a while, but seeing you with your bow convinced her. Thanks! oh joy of joys~! she is gonna love it its a great sport with a steep learning curve. so it builds confindece quickly. like on day one you go from hitting nothing to actually hitting the target! after that its just fine tuning and that does take some time but maaaaan is it ever fun!